When Kristi Idnurm showed up for work on a recent Sunday morning, she found a note waiting for her. 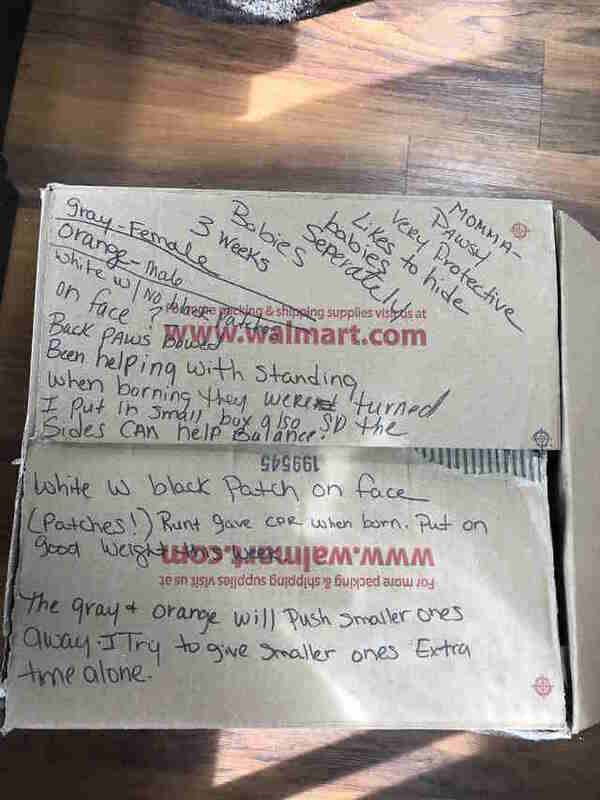 Three torn sheets of notebook paper were posted on the front door of Pet Valu in Georgetown, Delaware, where Idnurm works when she isn't running the rescue organization Kristi’s Kats, Inc.
As she glanced at what the note said, she realized she needed to rush out to the back of the store. There she found several boxes and crates covered in blankets, waiting. 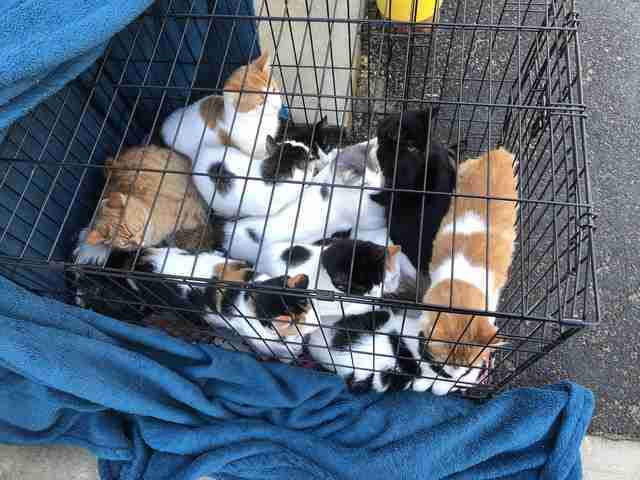 Inside were 22 cats and kittens. "It was quite the surprise to realize that there were cats left outside the store," Idnurm told The Dodo. Quite unlike other stories of animals being abandoned, these cats were obviously very well cared for. They were all litter box trained, and healthy. 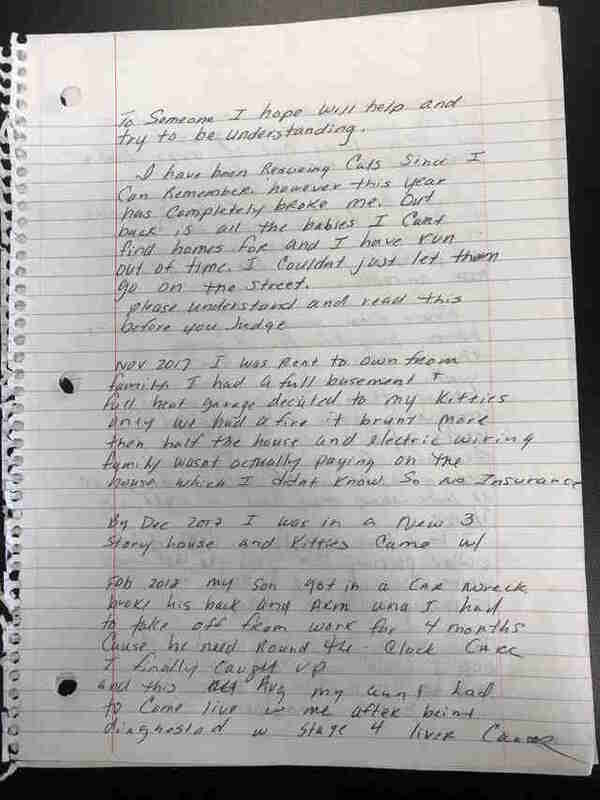 The note — which was left, along with the cats, sometime in the night between Saturday, January 5, and early on Sunday, January 6 — contained some explanation. "I have been rescuing cats for as long as I can remember," the note read, "however this year has completely broke me. 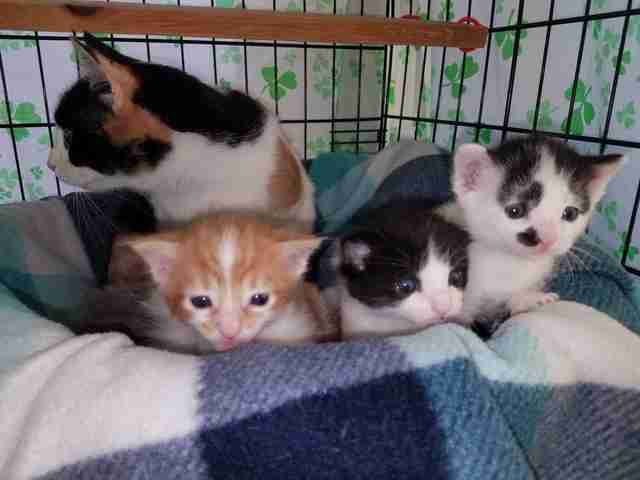 Out back is all the babies I can't find homes for and I have run out of time." The cats were clearly part of a larger, heartbreaking story. 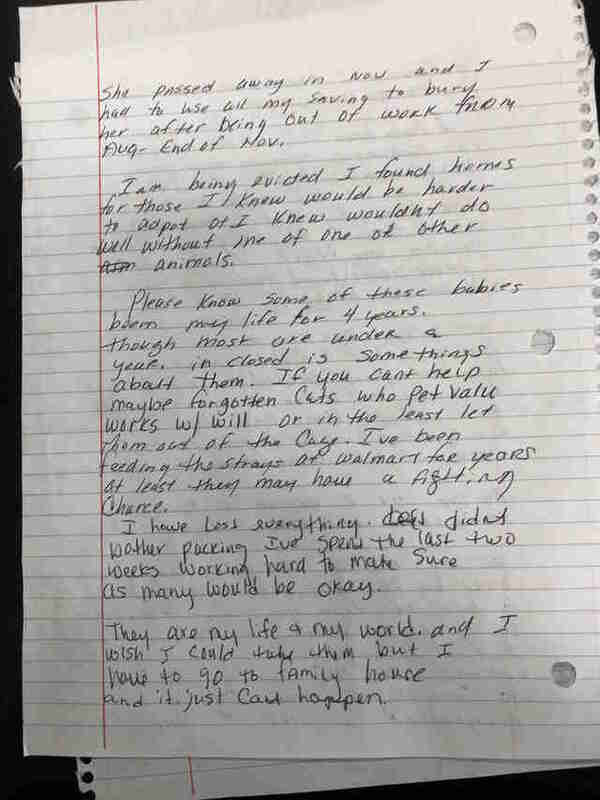 The note asked for understanding: “Please understand and read this before you judge." 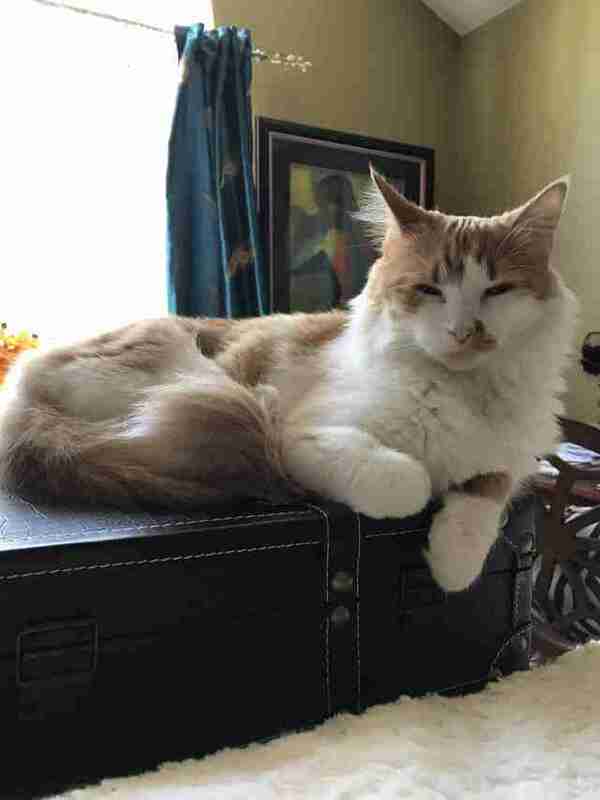 This person, who had devoted so much time to rescuing cats in need, had recently suffered sudden family tragedies. His or her son was in a car accident and needed a lot of care. An aunt became ill and died of liver cancer. The anonymous cat caretaker spent all of his or her savings to give the aunt a burial. Then the person received notice of being evicted from where he or she had been living. 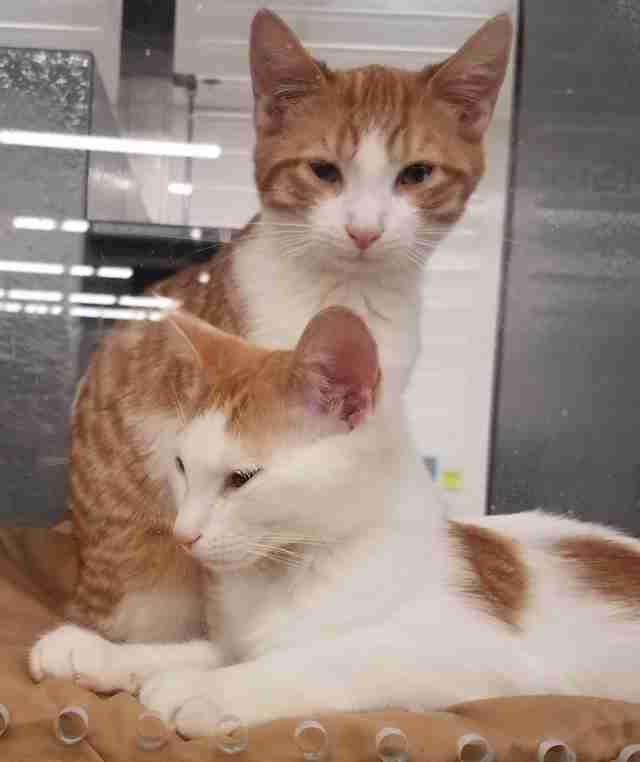 Instead of packing, the last few weeks before moving out were spent trying to find the cats homes. Along with the cats in the boxes and crates, the person left the last $30 he or she had. 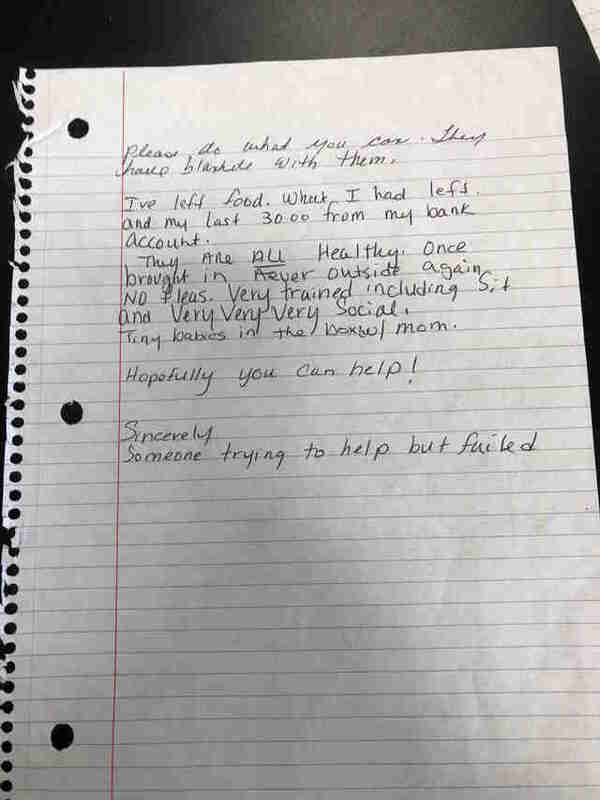 "I lost everything," the note said. Idnurm had to scramble to find places for the cats to go. After several desperate texts to volunteers with Kristi's Kats, she managed to coordinate fosters for all the cats. "My volunteers came in force to wash carriers, fill litter boxes, make lists and answer questions," Idnurm said. Some cats went to Town Cats of Ocean City in Maryland; others went to Coastal Cat Rescue in Bethany, Delaware. And some cats went to coworkers' homes while waiting for adoption. 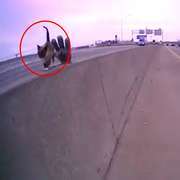 While abandoning animals is never a good idea, hopefully the group effort that gave these cats their happy ending can bring a little hope into the life of the person who so desperately left them. "It was a group effort on making sure they were safe," Idnurm said. 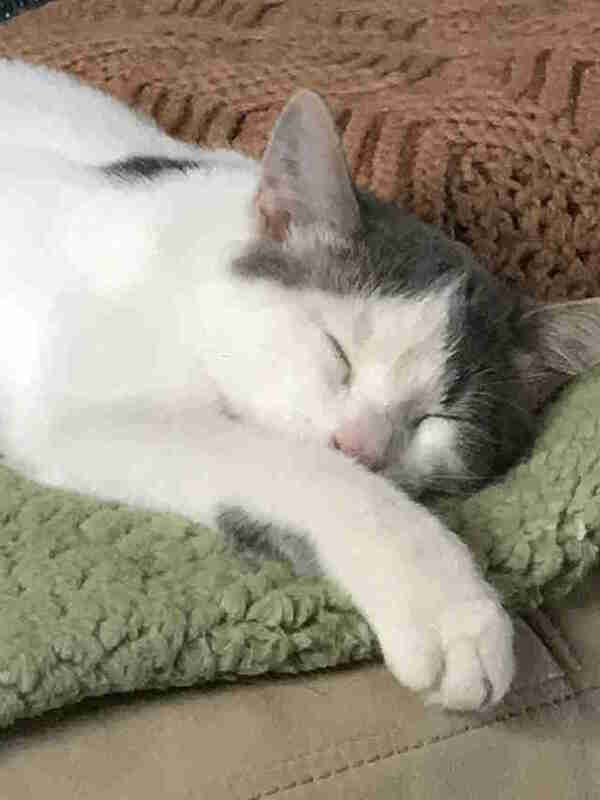 If you are interested in adopting one of these special cats or in making a donation toward their care, you can contact Kristi's Kats on Facebook.